Donald Trump has settled three Trump University lawsuits for $25m (£20m), the New York Attorney General has said. The US president-elect was being sued by former students who paid $35,000 (£28,000) for real estate “secrets” from his “hand-picked” instructors. Mr Trump had repeatedly said he would not settle the class-action lawsuits. Attorney General Eric Schneiderman said the settlement was a “stunning reversal” by Mr Trump and a “major victory” for victims. The businessman faced three fraud lawsuits – which alleged the school misled students and failed to deliver on its promises – in California and New York. A trial in one of the cases had been due to begin in San Diego on 28 November, although Mr Trump’s lawyers had attempted to delay the case. During the election campaign, Mr Trump was criticised for saying that the California judge hearing the case could not be impartial because he is of Mexican heritage. Attorney General Eric Schneiderman said in a statement: “Today’s $25 million [£20m] settlement agreement is a stunning reversal by Donald Trump and a major victory for the over 6,000 victims of his fraudulent university. Mr Schneiderman, who Mr Trump has attacked as a “lightweight”, had sought a $40m (£32m) payout from Mr Trump over the university, which closed in 2010. He called Trump University a “fraud from beginning to end” in July, adding that the organisation used “false promises to prey on desperate people”. US District Judge Gonzalo Curiel, who is presiding over the two California cases, had been urging both sides to settle out of court. In June, Mr Trump said: “I will win the Trump University case. I already am, as far as I’m concerned. Mr Trump would not admit any wrongdoing in the settlement, a source familiar with the settlement told the BBC earlier on Friday, adding that it is a “180 degree reversal” for the president-elect. Trump University promised students the opportunity to learn from “hand-picked” teachers, that actually were not chosen by Mr Trump himself. The closest students ever got to the real estate mogul was having their photo taken beside a cardboard cutout of him, Mr Schneiderman has alleged. He also said that Mr Trump personally pocketed about $5m (£4m) in the “scheme”. 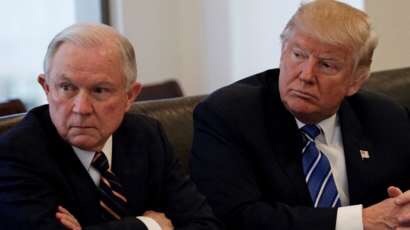 Meanwhile, Donald Trump has named more conservative hardliners for key posts, with Alabama Senator Jeff Sessions nominated as attorney general, the country’s top law enforcement office. Mr Sessions was rejected from becoming a federal judge in 1986 because of alleged racist remarks. In a statement, Mr Trump called Mr Sessions a “world class legal mind”. Mike Pompeo will be CIA director and retired Lt Gen Michael Flynn has been made national security adviser. Both men have been vocal critics of the Obama administration. 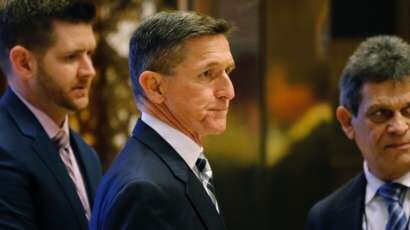 Gen Flynn, who was ousted as director of the Defence Intelligence Agency in 2014, agrees with Mr Trump on renegotiating the Iran nuclear deal, strengthening ties with Russia and intensifying the fight against Islamic extremists. Mr Trump’s Vice President-elect Mike Pence was reportedly booed on Friday as he attended a showing of the hit musical Hamilton in New York. “At Hamilton. Mike Pence is here and the entire theater just booed him,” wrote one theatregoer on Twitter. “Unreal scene here – Mike Pence walks in and there’s a massive mix of cheers and boos,” wrote another.